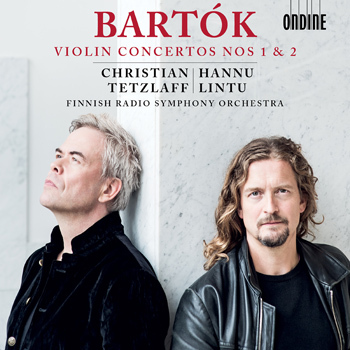 Star violinist Christian Tetzlaff performs Béla Bartók’s (1881–1945) two masterpieces in a new recording with Finnish Radio Symphony Orchestra conducted by Hannu Lintu. This recording continues both artists’ highly successful series of recordings on Ondine. ‘The two violin concertos of Béla Bartók (1881–1945), completed thirty years apart in 1908 and 1938 respectively, celebrated relationships with two Hungarian violinists: the first romantic, with Stefi Geyer and the second artistic, with Zoltán Székely. Bartók’s 1st Violin Concerto was published posthumously after the composer’s death in 1956, but Bartók reused the opening movement as the first of his Two Portraits for orchestra. He remarked in a letter written in late 1907 or early 1908 that ‘I have never written such direct music before’. Bartók completed two movements that portray the character of Stefi Geyer to whom the work was written to. Completed towards the end of 1938, Bartók’s three-movement 2nd Violin Concerto was a much more substantial concerto than his first essay in the medium and it was dedicated ‘to my dear friend Zoltán Székely’. Székely’s name can also be found in the of his Second Rhapsody. Bartók adopted a rather unusual approach to the overall form of the Second Violin Concerto and the impact of both rural folk music and urban verbunkos on his language can be found in the Second Violin Concerto. Christian Tetzlaff is considered one of the world’s leading international violinists and maintains a most extensive performing schedule. Musical America named him ‘Instrumentalist of the Year’ in 2005 and his recording of the violin concertos by Mendelssohn and Schumann, released on Ondine in 2011 (ODE 1195-2), received the ‘Preis der deutschen Schallplattenkritik’. Gramophone Magazine was choosing the recording of the Schumann Violin Sonatas with Lars Vogt (ODE 1205-2) as ‘Disc of the Month’ in January 2014. In addition, in 2015 ICMA awarded Christian Tetzlaff as the ‘Artist of the Year’. His recordings on Ondine with Brahms’ Trios (ODE 1271-2D) and Violin Concertos by Dvorák and Suk (1279-5) released in 2015 and 2016 earned GRAMMY nominations. Recordings by the Finnish Radio Symphony Orchestra under Hannu Lintu on Ondine have gathered excellent reviews in the international press. Their most recent release with orchestral works and songs by Jean Sibelius (ODE 1289-5) won an ICMA Award in January 2018. The same album was also Editor’s Choice in Gramophone Magazine and Orchestral Choice in the BBC Music Magazine.